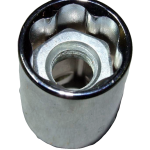 The point of the shoulder on a hex head is an inherent weak point anyway, more so on corroded fasteners where the material has been weakened. 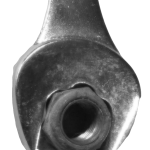 When the rust flakes away the head is slightly reduced in size so the spanner puts less force onto the faces, placing additional load onto the point. Metrinch’s 4 Wall Drive jaws put force onto the face rather than the shoulder of the head to reduce the possibility of damage to this weak point. Furthermore, if the shoulders are already damaged you are bringing force to bear away from that area on the relatively undamaged face. The third benefit is that they fit multiple head sizes across several size standards including Metric and Imperial, plus various international and multinational sizes. 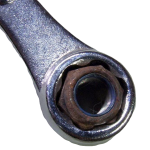 Each spanner fits multiple sizes.